Before I get into my experience with Borders, I want to clear one thing up. I’m not trying to complain or vent about not receiving payment for a few books. I don’t think the world needs to be turned upside down for such things. This is simply my experience and the way I handled it. As a self-published author, I know I am going to take losses sometimes. I just figured I’d share my slice of experience with others. I took a field trip Wednesday night to my local Borders book store. No, it wasn’t to purchase stacks of books before the company goes out of business. I already have stacks of books sitting on my desk that still need to be read. No, I went down to my local Borders to pick up the remainder of my books that haven’t sold in the last eight months. See, I did a book signing in their store in December 2010. The store ‘purchased’ ten books from me to put on their local author shelf. I was pretty excited at the time. Ten books is a big sale and the sales manager told me Borders would pay full price for my books – which is unheard of by the way. Usually big name bookstores as such will purchase books at a discount, sometimes even bringing a self-published authors bottom line into the red. My sales for this transaction were supposed to come to about $145. Not too shabby for ten books. Only problem is I never saw any of that money. Zip. Zero. Zilch. 0. I gave the sales manager an invoice a few days after the signing and she then sent it on to Borders corporate or wherever the invoice goes to be paid. Months went by and I heard nothing. It wasn’t the sales manager’s fault. She said she contacted Borders corporate and sent my invoice, as I would have expected her to. It was Borders who dragged this out. Months later I heard that Borders was going to shut down some of its stores and file bankruptcy and I panicked and contacted the store to see if I could get my unsold books back. Each book costs something out of my pocket, so if a store that had my books – and hadn’t paid for them yet – was going to go out of business, naturally I wanted those books back. The sales manager told me her store was going to stay open but if I wanted my books back she would comply. I thought about it and leaned toward the realization that it might be more beneficial for my books to have the prime real estate that a major book store chain offered rather than have my books sit on my own shelf here at home and collect dust. I told her I would be patient, at least for a little longer. More months went by. I sent another email to the sales manager requesting information regarding my payment. She said she was waiting to hear word back from corporate on when I would receive my check. So I said I would be patient still. 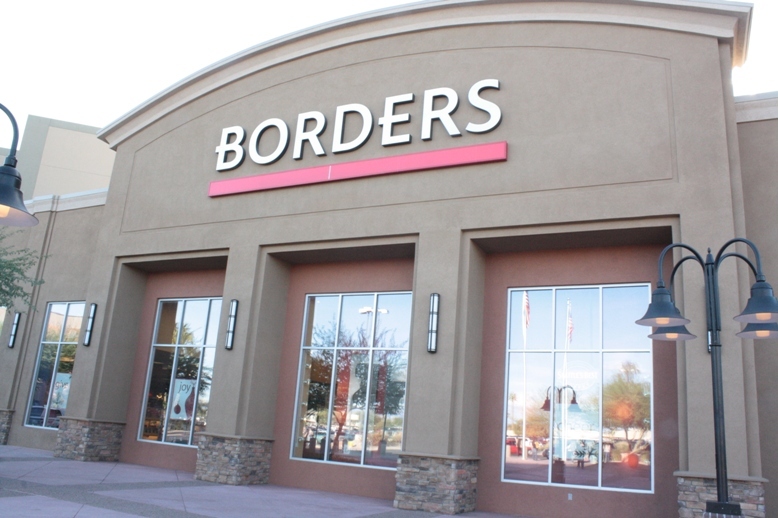 Word broke out on the internet a couple days ago that Borders was in the process of liquidating. I sent an email to the sales manager telling her I wished to get my unsold merchandise back, seeing how I hadn’t been paid and didn’t see any payment in my future. She understood and suggested I came to the store to do it before they got put in the liquidation pile for this coming Friday. Considering I only sold three books and had seven to pick up, I figured I’d just call the three books a loss. Well, monetary loss. Not really a loss loss. Three more readers – at the very least – have my books out there somewhere. My stories, out in the world, held by complete strangers. That’s got to be worth more than the purchase price of the books, right? When I arrived at the bookstore, the sales manager gave me a printed out email history that detailed the conversations she had been having with Borders in regards to my payment. Essentially, Borders said my book ‘sales’ to them were pre-petition debt and that legally they couldn’t pay me even if they wanted to. I asked what the legal mumbo jumbo meant and the sales manager told me that because I ‘sold’ Borders the books before they filed bankruptcy, that the sale is protected under bankruptcy law and I have to go through bankruptcy proceedings to get paid for the three that were actually sold. Yeah. I’m not all that sure it’s worth my time to go through the hassle to get my money from those. Don’t get me wrong. I’ve had a number of good experiences with Borders in the past. This last issue though wasn’t the first ‘bad’ experience I’ve had with them. Last year, I had a couple stores in Tucson request physical copies of my books that they could review before setting me up with store signings and I never heard back from them. Neither of those sales managers would even see me in person when I dropped off the books, even though they were in store and their store was an hour and a half from my home. There was another local Borders store manager who said to me he was in talks with his sales manager to set up a date for me to do a store signing. After a number of emails requesting the date, I realized he had decided to simply ignore me and hope that I would go away like a pesky fly nobody wants at their picnic. No signing was ever set up. The year before that, I had a great signing in that store. It was when the management got changed that I had the communication issues. These experiences are the main reason I try to stick with the local indie bookstores, mainly Bookmans. I get paid right away, I don’t get ignored when I request signings, and they fully support self-published authors. Oh well. Live and learn. My experience with the the Borders sales manager in the case of my missing payment was positive. I’m sorry to see such good people lose their job positions. C’est la vie. I do wish her the best of luck. At least my books are back and ready to find new homes. Bummer about those books, David. I don't think I'd go to the trouble either. Glad you shared this, though.